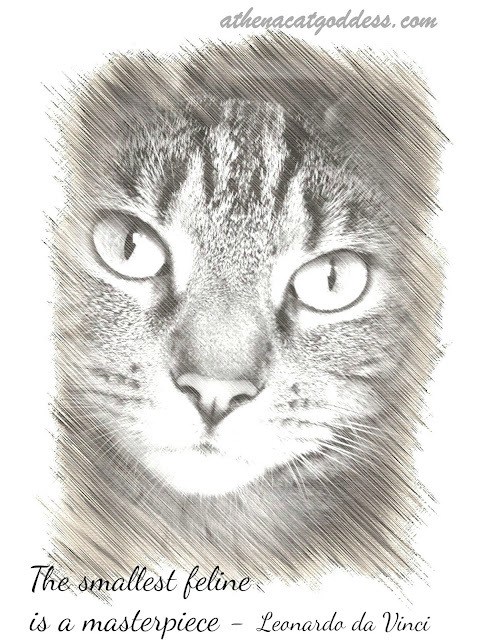 Just in case you're wondering - Mum edited my photo with the My Sketch app. Looks so realistic, doesn't it? You have such a sweet face, Athena! Your mom did a great job Athena. Hugs to you and Mum. Great job! You look beautiful. True. Cats are amazing, exquisite creatures. I love learning that certain famous people love/loved cats too. Shhh! Don't tell, I would have believed she drew it. You are a true masterpiece, Athena! I always love your photos. :) That da Vinci guy definitely knew what he was talking about. Your sketch is beautiful. I know. It's great to know that there were cat lovers back in those days too! Thank you. Yes, he had a great eye! That's one of my all-time favorite cat quotes. It's so true!